On a recent trip to the Negev with a Mechina – a pre army course based in Yaffo – I had the opportunity to take part in exploring the complexities of the Bedouin society in Israel. Dr. Thabet Abu Ras, co-director of The Abraham Fund Initiatives, led the tour, which took us to an unrecognised village as well as a community centre and a local high school in the area. Dr. Abu Ras began the tour by speaking about policy issue areas faced by unrecognized villages, including failed institutional support for infrastructure and education. Schools were only recently built and, due to geographic distance between villages, many students are unable to attend school regularly. Other issues include government led land use priorities, which would inevitably affect the Bedouin community’s lifestyle. This includes development and establishment of new cities where the Bedouin community are encouraged to live. The students were given the opportunity to ask questions. Most of the questioned centred around basic information relating to the Bedouin community in Israel, their service in the military and their culture and language. We then visited the village of Hura and the Abu Tlool school. We met with community representatives and discussed the complexity of living in a traditional community whilst also living in a westernised country. This trip exemplified to me a most remarkable dichotomy that I have often noted in Israel. It concerns the social fabric of this country: upon arrival I was struck by the warmth people hold for each other here, the immediate connection that can be felt. There is a strong feeling of togetherness and solidarity that is surprising to someone who is newly arrived from Western Europe, where a stranger is treated as a stranger more often than not. I have often thought that it is not only a cultural difference; it is also one that is institutionally supported, for example by service in the army, which binds together. Seeing these teens, who live and work and learn together for almost a year, made me think of this social strength. But for all the feelings of togetherness that are so striking in Israel, equally striking is the fact that this attitude has clear boundaries, and that the different populations live so separated from each other. These teens had rarely met with Bedouins and toured the Negev as total strangers to the local culture and its people, which is but an hour or two down the road from where they live. The boundary between them and the people they came to meet was stark and very visible. The strong social glue exists not only in the Jewish community; having visited Arab communities I have observed a similar attitude of inclusiveness that is much stronger than in many western cultures. No other place that I have visited in my life is at the same time so inclusive and yet so separated. The trip was concluded with the visit to the Abu Tlool High School, where the principle of the school discussed the problems the school faces. 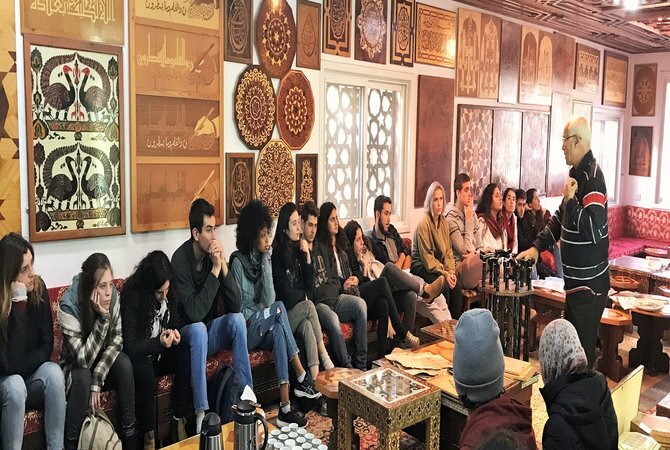 The topic of girls and education in the Bedouin society came up, as the principle explained that the girls sometimes still face parents and families that are unwilling to let their daughters finish high school or to go on to study. Again, this exemplified the stark societal differences that exist within Israel. The Mechina seemed fairly evenly distributed between girls and boys, and most if not all of them would be going to the army. With such strong differences between cultures, such points of connection as are created by programmes of cultural exchange and joint learning experiences are incredibly valuable. The beauty of Israel is in its diversity – it is home to radically different lifestyles, cultures, ideals and outlooks. For this diversity to be stable, ties between these worlds are imperative.